SOURCE BBC NEWS: Disability charity attacks rise in 'disgraceful' short care visits lasting just 15 minutesShort care visits to elderly and disabled people are "disgraceful" and on the rise, a charity has claimed. Leonard Cheshire Disability says 60% of councils in England use 15-minute visits, which are not long enough to provide adequate care. "It is disgraceful to force disabled people to choose whether to go thirsty or to go to the toilet by providing care visits as short as 15 minutes long." Research by the UK Homecare Association published last year suggested 87% of home visits in Northern Ireland lasted 30 minutes or less, 73% in England and 42% in both Scotland and Wales. Graphs at a glance: Are cuts to incomes and services really necessary? Are Britons really too expensive for Britain? 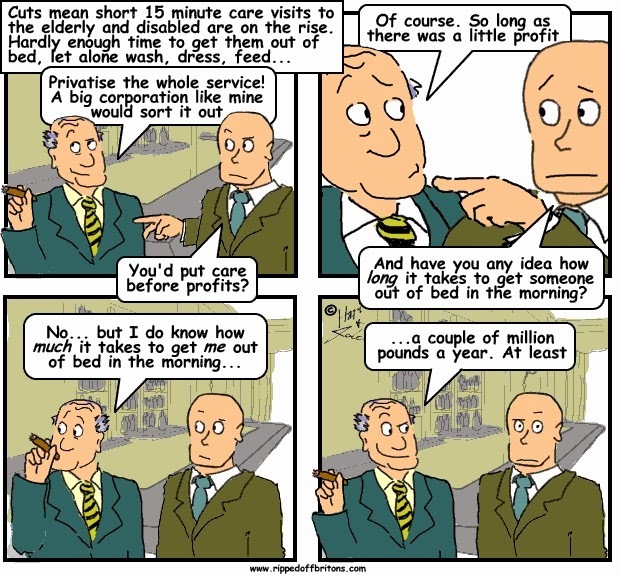 Tories propose you give up your Employment Rights in exchange for a bunch of shares - a repeat of the Manhattan Scam? Don't let's be beastly to the bankers!